Communication is the approach of conveying a desired message to the target audience to inform, educate or persuade them through different modes. Since the beginning of human civilization, we have been processing information visually. There was a time when only imagery, signs and symbols played a significant role in transferring ideas from one person to another. But with time, there has been a dramatic change in the way information is processed. In this era of lesser attention span, it has become essential to communicate with the target audience through a proven approach that processes information with ease. Today, we can’t deny the importance of visual communications. But you need specific components of visual communication to make it more compelling, intriguing and interesting. Before knowing more about the components of visual communication, let’s first understand what is visual communication? Visual communication is the means of delivering a message through visual elements, such as illustrations, drawings or electronic images. The characteristics of visual communication are defined by five types of visual communication: objects, models, graphs, maps and photographs. 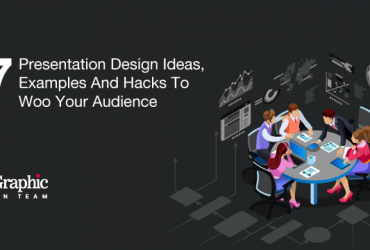 All these elements determine the look and feel of the presentation and make it all the more desirable for the audience. 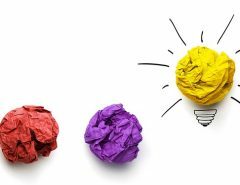 In marketing, visual communication has a crucial role to play. 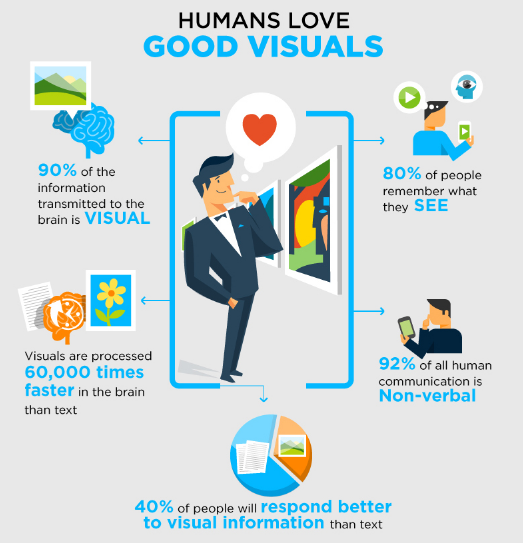 That’s because with the help of visual means the target audience can grab and digest information more efficiently. Hence, today, more and more marketers realize the advantages of communicating with the audience visually. Delivers the essential information more directly compared to texts. Has a more flexible character than that of verbal or textual communication. Is attention-grabbing and more engaging than that of other means. Creates a lasting impact on the audience and allows them to decide with ease. Your message gets a newer dimension and thereby it increases the credibility of your message. Colors play a significant role in visual communication. Being the most essential elements of visual communication, the primary function of colors is to decorate, emphasize or categorize a design. Colors have a deep connection with human emotions and experiences, they create an optical effect on us, to put simply, they communicate optically and emotionally. Amongst all visual communication components, colors have a central aspect as they create depth in the portrait thereby constituting a depth in the hierarchy as well. Needless to say, the right use of colors enhances the effect of form in the representation. Designers need to understand that conceiving a visual material requires an in-depth understanding of the fact that relationships between colors cause an optical effect, warm colors advance and cool colors recede. Using two different models – additive colors and subtractive colors a graphic designer can create a treat for the eye. In visual communication, shapes are among those fundamental components besides colors that have a huge magnitude for grabbing the attention of the audience to the piece. These elements also have the prowess to create an emotional effect on the audience. It’s imperative to understand that shapes exist in two main categories – organic or biomorphic forms (that are random and flowing in character and are mostly used to depict natural materials) and geometric or rectilinear shapes (that constitute man-made or mathematical designs and are ideal for drawing industrial patterns). Besides these two there are abstract shapes and this type finds maximum importance in the field of graphic designing. The function of a shape is to create an effect on a symbol and to build an outstanding impression on the audience, they influence an audience’s thought process and help him/her to take effective decisions. A typical shape can enhance the mood and message of a design. Shapes come in assorted forms, color, size and each conveys a different type of feeling or emotion. 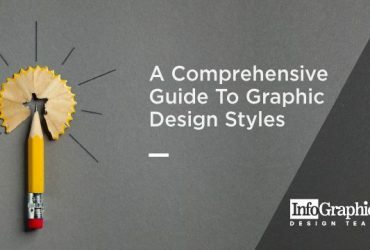 In graphic designing shapes are mostly used to organize, connect or separate elements and content. They may also symbolize or represent a concept, provide depth or texture. Designers can metamorphose any design through different shapes available. A tone is a variation of the intensity of color. Tones come as light or dark and are mostly identified by the value, percentage, tint and shade. Color tones refer to variation in a range in a monochromatic field and can be used to create or emphasize a particular visual representation with linear or radial gradients. 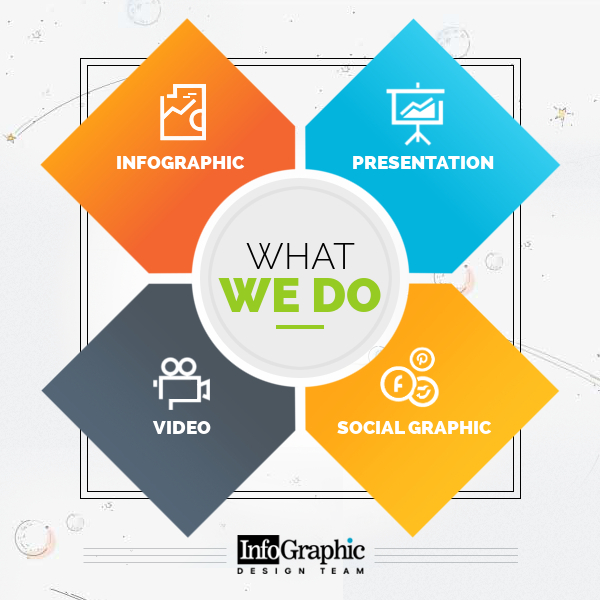 The purpose of the tone is to highlight a graphical presentation like an infographic besides it can be used to shade a drawing to make it look three dimensional as well. The nature of tone is used to give the image a gradual, harsh, soft, dramatic or subtle look. Tones come into existence when you add both black and white to a hue. Tones display subtle and complex qualities in a tint or combination of shades and reveal how we see colors in the real world. Tone coloring is a decorative technique that involves the usage of a single or a few colors and uses different saturation of those colors. Texture is the surface of an object or an image and can be actual or implied. Actual texture can be felt whereas implied textures look like real texture. Textures are available as rough or smooth, random or regular and deep or shallow to describe the surface. The presence of texture in a graphical presentation displays a more human or friendly feel to an image and the lack creates a corporate, professional feel. To put simply, the thoughtful use of textures can enhance the visual experience you want to convey to your audience in addition to that this element further amplifies the context for the content. Also, adding texture to an image offers a bit of visceral depth to the two-dimensional design. A designer can generate raster or vector software like Photoshop or Adobe Illustrator to tie one piece of design to another or become a defining element of a brand or a series of communications. Figure-ground is yet another most essential elements of visual communication. It refers to the relationship between a figure, i.e., the shape, object, type, etc. along with its background. They are ideally the shapes, space or forms within a composition. In this designing component, the ‘figure’ is the one that a viewer sees and the ‘ground’ is the other surrounding areas. The ‘figure’ is known as ‘ the positive space,’ and refers to those images that are visually dominant on the ground and the ‘ground’ is referred to as the ‘negative space’ or the background (the surrounding area that the figure is placed upon). According to the designing principles an image can either be image dominant or ground dominant. In visual representation, figure-ground is crucial in providing distinctness in visual communication. However, designers may choose to emphasize figures by creating a strong contrast in color, texture, etc. or to hide them in opposite ways. Balance has an immense impact on visual communication. It is actually the arrangement of components on two sides of a vertical axis (the demarcation is either seen or implied). In visual communication, there are two ways to balance a composition- symmetrical balance and asymmetrical balance. Symmetrical Balance: Where the two sides of the composition are the same or nearly the same and they produce a mirror image of each other. In the graphical representation, it creates a stable and static composition and is well-suited to present informative or instructional visual communication. Asymmetrical Balance: According to this balanced type through two sides of the composition is balanced, yet they are not mirrored to achieve balance off center. While creating an image with asymmetrical balance, different sized components get more or less visual weight. In any graphical portrayal, visual weight can be increased or decreased by changing one or more of tone color size or proximity to the central axis. Designers prefer to use visual communication employing asymmetrical balance to give a more dynamic composition so that audiences get encouraged to interact with the design. In communication design, the hierarchy is a fundamental design principle and is created by the use of design elements that include scale, color, shape and other factors including position. It’s proven that objects nearer to the center of the top of a composition attract maximum attention. Hence, visual hierarchy plays an imperative role in visual designing to describe the sequence of elements in a particular composition. It can help lead your audience through an entire message. The purpose of hierarchy in visual communication is to let the viewers help them travel through the visual part by part thereby helping them to process their brain through the information in the designers intended way. Establishing a focal point on a page is important. This is necessary to give your audience a place to start navigating your website and showing them where the most important information is. It offers guidance to your viewers and helps them to communicate what they want them to do next. 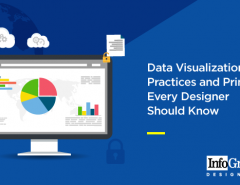 Infographics are one of the most impressive means of visual communication. 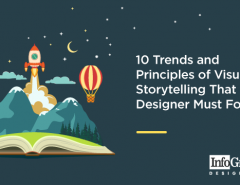 An audience can relate to these means so conveniently that they prefer to process information designers can unleash their creativity in an infographic utilizing the different components for maximum effect. 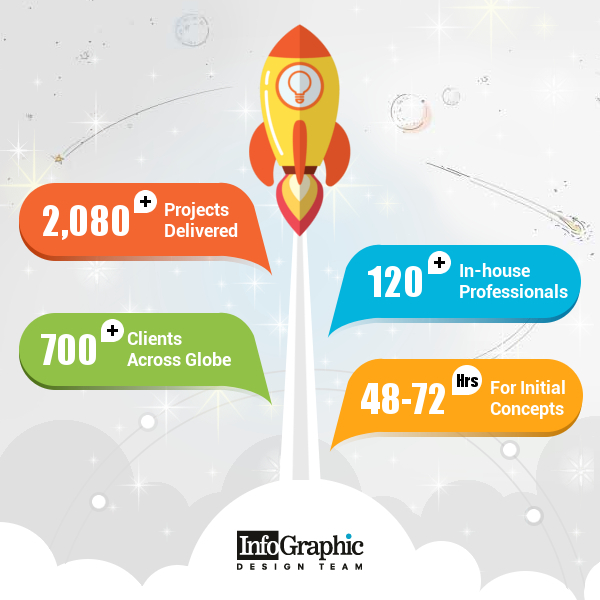 The creative pros at Infographic Design Team are always prepared to assist you in giving your best at presenting the best infographic.